Well, here she is again. I drew it much smaller then the last one, but refined her costume a little. Not as much detail or time on the face... and I need to work on drawing feet! I'll update this post with what pen tools I used soon. In anycase, I've mostly figured out her design. 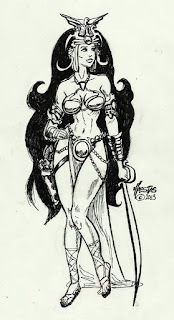 I have Dejah Thoris, now it's time to draw John Carter, Warlord of Mars! So, I decided that for the #100 contest should be OMEGA RED. He has been one of my favorite villains since Jim Lee drew him over 20 years ago. Omega Red is due March 12th. I'm also attempting a cyborg contest on the forum- that one is due on March 8th. I'm still trying to think of something to do. 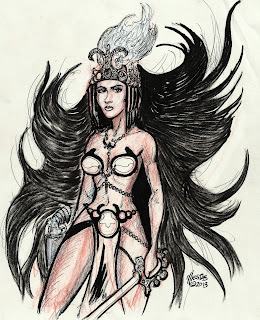 I haven't drawn Dejah Thoris for nearly twenty years. I admit, this one is a little sloppy. Actually, I'm not happy with it at all. However, that's how you improve- you put the successes out there AND the failures, and you learn from them pushing yourself to get better next time. It started out as a quick sketch, then I broke out the ink. I didn't really spend much of time on anatomy... it was simply experimenting with tools and having some fun. Her hair got away from me- I dried out my brush pen on her it. All in all, it turned out okay. I think I'll put her into an action pose next time, fix the anatomy, more detail on her costume and accessories... and not let the hair be so wild! Well, I'm trying to get back into the swing of things. It's been a while since I've finished a drawing, much less colorize it. So, at the suggestion of my good friend Robert Schaupp, I've been attempting to do the no-prize forum contests at Comicvine. 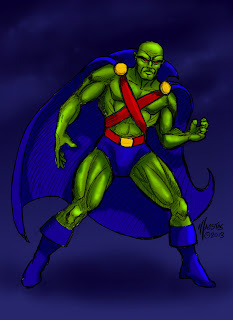 The last one was my ATOMA drawing, but here's the newest contest entry for a simple pinup- Martian Manhunter! It turned out okay- but it's all about creating a drawing with a deadline! It's been a very hard winter. My dad passed away after a long fight with cancer and Parkinson's, and we laid him to rest with full military honors just a week ago. He is the one who got me into comic books, movies, and cars. He took me to my first air show, and he loved adventure stories. So, this next project is very personal to me. It is a high adventure comic series that will have the classic feel of all the old serials, and will certainly be in the Milton Caniff school of cartooning- with a heavy dose of my other heroes: Al Williamson, Wally Wood, and Mark Schultz. As you can see here, I'm preparing some reference material- the heroine's plane- a P-38. I haven't built a model since my dad gave me my last one when I was 13, so it's a mess. It certainly has been a journey of memories, though.